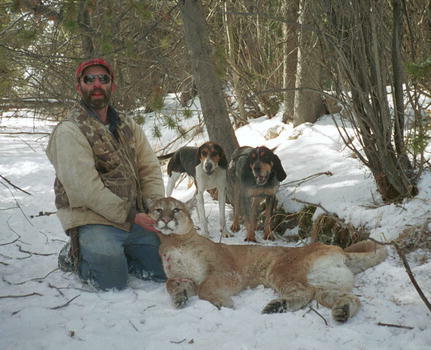 Pinedale's Steve Reeser, his hounds, and the resident mountain lion that was killed last Sunday morning. Game & Fish personnel tracked down and killed a young male mountain lion just north of the town of Pinedale early Sunday morning. Mountain lions prowling the town of Pinedale have been a problem since last fall. About 7 a.m., Chopper Grassell woke up to the mountain lion "walking around the back yard." Mr. Grassell's property is located in the subdivision north of Pinedale on Pine Creek and just off the Soda Lake Road. Chopper first noticed his dog, a Labrador retriever, acting very agitated. "My dog has about two inches of hair," says Mr. Grassell, "and it was standing up about six inches high." The dog wasn't barking, but rather was "crouched down under a bench on the back deck just going crazy." Mr. Grassell then noticed the lion walking through his yard. He'd seen a treed lion before, but this was the first time Mr. Grassell had ever seen a mountain lion walking around on the ground. "He was a beautiful animal," says Mr. Grassell. Chopper walked out onto the deck and yelled at the lion. "He just looked at me, he didn't run or anything. He just nonchalantly walked off." The lion's calm behavior demonstrated that it was obviously used to people and barking dogs. Dennis Almquist, Chopper Grassell and Doug McWhirter with the lion. Mr. Grassell immediately called the Game & Fish who in turn called Pinedale houndsman Steve Reeser. 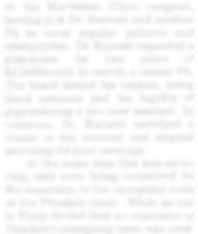 Soon, four G&F personnel, Bernie Holz, Doug McWhirter, Scott Edberg, and Dennis Almquist, plus Mr. Reeser and his three hounds met at Mr. Grassell's home. According to Scott Edberg, the three hounds were put on the lion's trail at around 8:30 a.m. The lion had traveled up and down the creek several times, and according to Mr. Reeser, had not only retraced his trail, but also had stepped in his own tracks. This confused Steve and his hounds, and took them four hours to straighten out exactly where the lion had gone. At approximately 12:30 a.m., the lion was treed on Denny Schroeder's property about 500 yards north of Mr. Grassell's home. 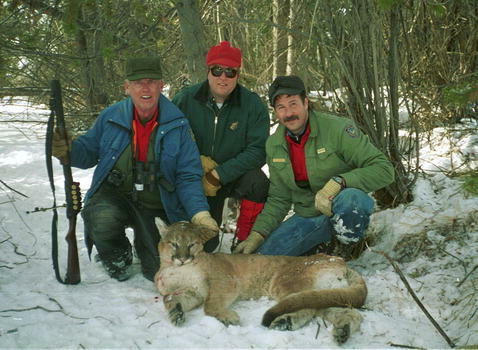 Game & Fish personnel killed the mountain lion at that time. The lion was a young male, approximately 2 1/2 to 3 1/2 years old. It bottomed out a 100-pound pack scale and the G&F estimates it weighed approximately 120 pounds and stood with a shoulder height of approximately 28 inches. The lion showed several signs of injury from some other type of fight. One of its eyes was damaged, an ear was partly torn, and its hind legs showed bite marks. Biologist Doug McWhirter theorizes that a larger lion might have fought this lion and pushed it out of some other area. Mr. McWhirter thinks the young Tom, now injured, may have had trouble hunting and ended up in town prowling along Pine Creek. Game Warden Dennis Almquist said this was the first confirmed lion sighting he's investigated all winter. According to Mr. McWhirter, the G&F chose to kill the lion because of it was obviously very comfortable around people and pets. "This was definitely a human safety issue," says Mr. McWhirter. Mountain lions have been responsible for several human attacks throughout the Intermountain West in recent years. Mr. McWhirter said the G&F didn't want to take any chance with this lion moving into town or around people again. For her part, Pinedale Animal Control Officer Julie Early believes there is yet another, larger, lion patrolling town. "I still think there's a big one," she said. The lion's carcass is currently located in a chest freezer at the Pinedale G&F office. According to the G&F's Scott Edberg, the carcass will be used for training, and eventually donated to the town or the Mountain Man Museum.